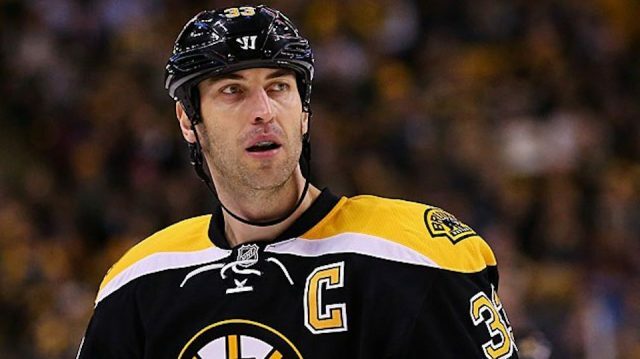 Thursday night in Edmonton, Boston Bruins captain Zdeno Chara played in his 900th game with the team, being only the sixth member in franchise history to do so. Chara joins a group of elite Bruins players who have done so, including two whose numbers are hanging from the TD Garden rafters as well as in the Hockey Hall of Fame: Johnny Bucyk and Ray Bourque. Ray Bourque holds the most games played with the Bruins at 1,518 games, followed by left winger Johnny Bucyk at 1,436 games. Bourque’s career as a defenseman came only two years after Bucyk’s, and he played with the Bruins for 21 seasons but never won a Stanley Cup. Third and fourth on the list are Don Sweeney and Wayne Cashman, respectively. Sweeney played 1,052 games as a defenseman with the Bruins from 1988 to 2004, then retired to do several years of work as a broadcaster until he came to work in the club’s front office in 2006. Now, he’s the Bruins general manager. Cashman, who may be remembered by Bruins fans that grew up watching Bucyk and Bobby Orr play, was a winger for the Bruins who played on a historic line with Ken Hodge and Phil Esposito. Cashman retired at the end of the 1982-83 season, and was the last player from the Original Six era in the NHL to retire. Fifth on the list is Chara’s own teammate and alternate captain Patrice Bergeron. Bergeron played in game 970 of his career with the Bruins Thursday night, meaning if he continues to play even half of this season, he will reach his 1,000-game milestone before the season is over. That is a landmark that Chara can hope to play in, though it may not come to pass for the now 41-year-old. While Chara shows no signs of slowing down just yet, his game could absolutely change in the next season and a half. Bergeron, however, just celebrated his birthday No.33 this summer and could very well have another decade of play in him. The reason Bergeron, who is eight years Chara’s junior, has more games on him than the towering defenseman, is because Chara joined the Bruins club in 2006 after he spent four seasons with the New York Islanders and another four the Ottawa Senators before signing with the Bruins. Chara has played 1,430 career NHL games and is sixth overall for most games played out of active players in the NHL and No.32 of all time. If Chara had been with the Bruins since his first day in the league, he would surpass Johnny Bucyk on the list of most Bruins’ games played, and perhaps even ascend beyond Bourque’s 1,518 games to hold the record. Perhaps, though, that’s something for Bergeron to do instead.